Well, it's good to say that people now are more pro-health and picky when it comes to foods and drinks. More than it's taste, people nowadays appreciate the benefits that tea brings to us. More than just an antioxidant which everybody knows, tea has also Vitamin C which is good for the skin, natural source for fluoride, and it also enhances immune system and lowers risk for infection. There's still more that tea offers. Tea also contains caffeine but most teas have lower content compared to coffee. There are many factors influencing caffeine levels in tea, including brewing time / temperature, tea grade and tea varietal. More than just a beverage, tea has become a social art form. And like every art form, it has led to a change in perspective. As the years have shown, the steeping of the cup is pivotal to the steeping of society. Thousand Teas, according to its owner, Gilbert Jim, is all about everything you need from the tea (from the word "Thousands"), from tea leaves to the paraphernalia, from tumblers to pitchers, we have everything. The place is cozy and you will really feel the relaxing ambiance of the place perfect for the everyone who want to sip a tea to release tension and escape from their stressors. 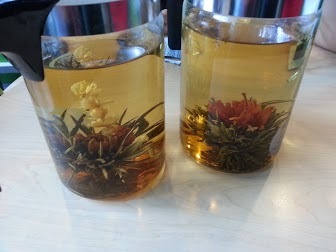 What makes this tea-place different from any other in the metro, they're not using the usual method that we know which is the use of tea bags, expect for a unique experience because they use unfamiliar but the traditional yet the best materials. They serve their hot teas in glass cups with tea filter. Within effervescent confines scented with the fresh aroma of the posh yet classic beverage, it offers a wide variety of drinks and flavors that are either time tested or avant garde. Complementing the wide selection of teas are the pastry and pasta selections. Emulating the sophisticated refinement of the British tea culture with a little Asian mix, customers can choose between traditional tea time fare like scones and cakes or they can mix and match with various dishes to suit their mood and taste. Thousand Teas is located at Mezza Residences, Aurora Blvd., Quezon City. If you're a real tea connoisseur, then you'll probably be interested in finding some worthwhile sippings wherever you go. If you're still not a regular tea-drinker, why not change your daily tea rituals and see what effects the above have on you. I can say now that I have incorporated these wonderful teas in a my daily life. 25 wishes for my 25th birthday!